Freshly out of Borla R&D, the Borla "Climber" exhaust system debuted at the 2015 Easter Jeep® Safari. Fits 2012-2015 Jeep® Wrangler Unlimited 3.6L 4-door (JKU), confirmed on Sport & Rubicon. 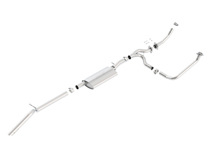 Loop delete Y-pipe keeps factory catalytic converters, keeps your Jeep® factory warranty intact, and stays EPA/CARB emissions legal. Cut on driver-side pipe required, rest is bolt-on installation. No welding required. Cross-over pipe fitment & location allows Borla Climber exhaust system to fit a wide variety of suspension & armor upgrades. High clearance cat-back tucks above frame rails. Removes rear-most factory muffler, increasing departure angle or freeing up room for accessories. Aggressive "S-Type" sound under acceleration, no drone at highway speeds. Built from T-304 Austenitic stainless steel, will not rust. Backed by Borla industry-leading 1,000,000 Mile Warranty. JKU Wrangler 4 door "Climber"
Dual 2" into single 2.5"